Why Americans Speak With a Hot Potato in Their Mouth? Quite a few foreigners have told me that American English is the easiest to understand, and I can see why it might be the case (I’m not talking about regional accents, of course, but the language you can hear on TV news broadcasts, for example). First of all, when Americans speak, they pronounce all sounds very distinctly, especially the consonants ‘r’ and ‘l’ so they don’t blend with other sounds. Secondly, when Americans speak, their whole mouth literally resonates the sounds because the range of their tongue and cheek movement is much bigger than that of speakers of other English speaking nationalities. And finally, Americans stretch the words a little bit (especially the first syllable) thus making them easier to understand. Of course, American English speakers are capable of speaking a lot faster than your average news broadcaster whose primary goal is to be understood by the audience (hence the slower speech). Also, you wouldn’t have to push your comprehension to its limits when listening to Sky (British) or RTE (Irish) news broadcasts because they also have to adhere to the same guidelines. Fast speech is often mistaken for a sure sign of fluency in the English language, so it’s no wonder many foreigners aspire to speak very fast to be perceived as fluent English speakers. You may get completely stuck in a middle of a conversation! As you can imagine, there’s a very simple cure to deal with these problems. You just have to slow your speech down! It can be done in a number of ways. You can pause. You can pronounce words slower. And then there’s the American accent which is just the perfect way of speaking in order to prevent all these fluency issues! Basically it boils down to this – the American way of pronouncing words forces you to pronounce them fully and clearly without blending them together which may curb the speed of your speech and facilitate fluency. Personally I find that pronouncing the ‘r’ and ‘l’ sounds the American way helps with the overall fluency of my speech. Americans pronounce the ‘r’ sound thoroughly, distinctly, and I guess the easiest way to replicate that sound is to imagine that something is stuck in your throat and you want to get rid of it. Well, it’s not THAT throaty, and you have to ‘move’ the sound from deep inside your throat further up your mouth so that eventually the sound emanates from somewhere between your throat and your lips. The most important fact to bear in mind, however, is that Americans pronounce ALL letters ‘r’ unlike British English, for instance, where ‘r’s are very vague. American ‘mother’ [ˈmʌðər] is [ˈmʌðə] in England; you kind of don’t even pronounce the ‘r’ letter when speaking British English so I’d say about 25% of the word isn’t even pronounced. So when you speak American, you pronounce all ‘r’s and I believe it works as an anchor helping you to form sentences and take time to gather thoughts. The ‘r’s can be stretched a little bit longer than necessary (especially when they’re placed in word endings) thus helping you to plan your speech and think of any words you might be struggling to come up with – so you can think of the ‘r’ sound as a hesitation filler! Same goes with the ‘l’ sound. It’s formed by pressing the tip of your tongue against the roof of your mouth right behind your teeth, and once again – it’s a very distinct and strong sound which helps with your speech formation. I remember from a long time ago when I was a child that someone described the English speech by comparing it with speaking with a hot potato in your mouth. And it’s actually true, especially when it comes to speaking with the American accent. When Americans speak, their whole mouth resonates the sounds and it can indeed resemble someone trying to speak while holding something in their mouth. Of course, it’s an exaggeration, and in real life you’ll hardly see any American person speaking with their cheeks inflated. Anyway, it’s a very powerful technique to get used to speaking with the General American Pronunciation, so I warmly suggest you to imagine that you’re trying to hold something in your mouth while speaking to develop your American accent! Actually holding a potato in your mouth isn’t the best way to resemble the American accent. Try to imagine you’ve taken a little bit of water in your mouth, just a tiny bit, and you don’t want to spill it out when speaking. So that half a mouthful of water is sitting at the bottom of your mouth right below your tongue, so you’re forced to speak without letting your tongue to touch the floor of your mouth. That’s exactly how Americans speak, and it’s the easiest way for a foreign English speaker to develop the American accent. Let your cheeks resonate the words; you can even put on a mock smile to draw your lip corners back and get your cheeks into the right position. Anyway, I’ll be making videos in the near future about all these aspects of the General American Pronunciation, so if this is all too confusing, stay tuned and keep checking back to my blog for more information on how to speak like an American! The bottom line here is – speaking with a potato or water in your mouth and resonating the sounds with your cheeks definitely forces you to speak a little bit slower, you’re forced to focus on the way you form words, so you’ll be less tempted to start speaking too fast which is great for your spoken English fluency. It’s another reason why American English is slower than its European and South Pacific counterparts. Of course, you don’t stretch the first syllable of EVERY word when you put on the General American Accent; if you did that, you’d sound more like a Southerner (which I’m definitely going to learn as part of my accent missions), that’s for sure! Yet even the General American Accent has a lot of stretched first word syllables and I’ll also focus on that in my future videos which I’m going to make as part of my General American Accent mission. For now, here are a couple of examples so that you can get the general idea of what I’m talking about here. ‘Probably’ is more like [‘praaahbəbli] than [‘prɒbəbli] which is the standard phonetic transcription you’d find in dictionaries. And similarly, when you say ‘possible’, you stretch the first syllable resulting in [‘paaahsəbl] rather than the standard [‘pɒsəbl]. Of course, it’s not going to guarantee you’ll sound like an American right away, but it’s a good start, and I’ll discuss all these things in my future blog posts and videos. 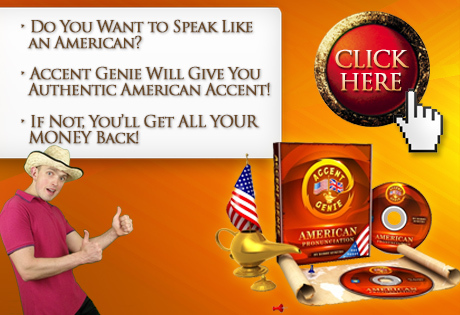 And don’t forget – thanks to these distinctions of the American accent, you’ll speak slower and clearer thus facilitating your fluency (especially if you have a tendency of trying to speak fast and catch up with native English speakers). I’m german and i understand the BBC English (British news television english) way better than american news television english, because of NO potatoe in the mouth. Well, I guess it’s different strokes for different folks! I personally prefer the American one; that being said, I love certain British news programs so I guess it’s just a matter of getting used to one or the other. And as always what you prefer now can change with time. For AE it definitely needs more time (habituation effect) for loving it, at least for me. 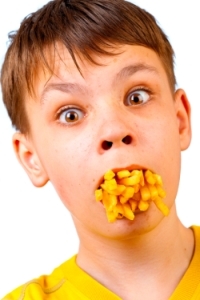 I’ve only heard German people say us Americans talk with a hot potato in our mouths. Maybe British English is easier for Germans to understand than American English. If you’re watching the BBC though they speak with a very neutral accent, some British accents, especially Scottish ones can be difficult for me to understand and English is my native language. I think more Americans speak with a “standard” American accent than British people speak with “standard” British accents. In the UK it seems like every city has a different accent. Outside the south most Americans speak with an accent that’s at least close to standard. I certainly wouldn’t say bottom with an r sound, more like a soft d. At best, it’s close to the tap r in Spanish, but not like an American r. One the west coast, we say the r very hard. I tried it as written. It sounded more like I was saying bar room. Or maybe broom with an extra ah. Well, fair enough, it’s not a clear ‘r’ sound, but I never meant that it’s like a typical American ‘r’ sound, it’s indeed more like the rolled ‘r’! Well, I can see where you’re coming from on this – and yes, I have to admit that if we compare the two Englishes – American and British – the latter one is probably more difficult to for an untrained ear to understand! You can listen to different regional accents watching some movies in English. For example, “No Country for Old Men” features actors speaking with the West Texas accent, which is a bit difficult to understand! I’m very used to the GA accent, what with all the films I watch, the CNN, etc. you’ll probably need to demonstrate the water in your mauth technique in front of us in one of your videos so we could follow suite :). i also attempted to master the american accent but i got the “r” sound all wrong.after countless of efforts my work is finally baring fruite i think i’m making a good progress. I am actually planning to use the water-in-mouth technique to demonstrate how it actually happens, and you’ll see it posted on the blog next Monday! And congrats with your progress – well done, I would actually like to see a video recording of you speaking, so if you ever get round to that – keep me updated! Spot on! It’s a perfect occasion to use that idiomatic expression! Next post: Find It Hard to Speak Like an American? Just Take Some Water in Your Mouth!